WE’VE ALREADY LOOKED at the best places to take your carnivore mates. Try taking your veggie mates to these spots to make sure you please everyone. If you’re looking for a good spot to have Italian, they do a great spinach and ricotta tortellini and venture outside the usual pasta and tomato vegetarian option. They also have a good ratio of meat to veg pizzas and an adventurous appetiser selection. If it’s Moroccan you fancy, look no further. This place has a superb selection of vegetarian options that will put any veggie out of their comfort zone. You’ll wish you had less of a decision to make. Undoubtedly one of the best Chinese joints in Dublin, their vegetarian menu is not only plentiful, but it’s all extremely delicious. Forget chewy tofu or dry vegetables, and try the green beans and braised tofu in spicy sauce, while the carnivores can tuck into the pork dumplings. If you’ve got a hankering for an excellent steak, but can’t find a suitable place to take your veg friends, head to Darwins. Their steaks are some of Dublin’s finest, and they also have an unusual vegetarian menu to please all tastes. Nepalese food is plentiful in vegetarian options, and Monty’s has em all for your veggie eating pleasure. Along with a hefty selection of meat dishes, the classic Aloo Tama Pidalo is a must-have. This is one of Dublin’s finest Indians, and basically gives the option of vegetarian on most dishes available. Pick a curry, and go chicken, duck, lamb, prawn or vegetables. All are happy, all are full. Not only do Fallon and Byrne do a hefty and fresh vegetarian menu, they also have a special vegan menu. Their menu is seasonal so changes from time to time but there’s usually something for everyone. Yamamori has an excellent selection of vegetable rice, tofu steak, veggie bentos, and vegetarian sushi rolls, while the carnivores have the option of burgers, moreish fish norimaki and chicken ramen. This place is tapas central, and has a huge vegetarian selection as well as a hot and cold meat selection. You may not be able to share the whole table, but dip into something veggie, and you might be surprised. Another tapas spot, with plenty of choice for the vegetarians and even more for the meat lovers to share. Don’t forget to go downstairs and to check out the toilets, they’re unreal. This is the best lunch spot to take your veggie pals as they have a solid Jamaican jerk chicken salad for you, and a falafel that many a vegan would kill you for. This place has feels like it’s excellent for you, with meat and vegetables sourced . You can get health, non processed food and organic, free range fare that’s seasonal and bound to impress the veggies in your life while you wolf down a fillet of Irish beef with Jameson Whiskey pepper sauce. While many burger joints seem to forget that vegetarians exist, Bobos has a great selection of falafel and bean burgers to supplement their MASSIVE carnivore menu. Everyone gains. Email “13 places to take your vegetarian friends to eat in Dublin”. 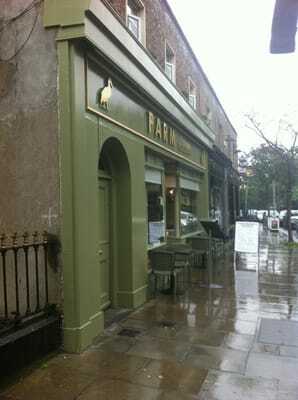 Feedback on “13 places to take your vegetarian friends to eat in Dublin”.